Freshwater pumps deliver water to fixtures onboard a boat. Pressurized water systems make life aboard more comfortable by providing water "on tap" for dishwashing, showers and other applications. The complexity of installing and maintaining one will depend on the number of outlets and accessories you choose. 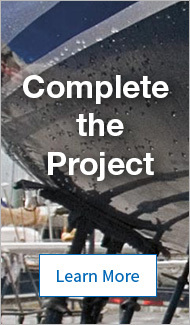 The Whale Water System is a user-friendly system for the do-it-yourself boat owner. Where they are used: On all boats larger than runabouts and daysailers, fresh water on board is both a convenience and a necessity. The freshwater pump is at the heart of the delivery system that ensures a constant supply to the fixtures in galley, head and shower. Do you want on-demand water supply? On-demand pumps have a pressure switch that makes the pump build up pressure in the fresh water line. Whenever water is demanded and the faucet is opened, a stream of pressurized water will be available. The pump turns on to maintain this pressure as needed. By contrast, manual pumps have no pressure switch, and must be turned on manually (via an electric switch) prior to when the water is required. How many outlets does the pump need to serve? Freshwater pumps are frequently described by how many outlets they can supply ("for two or three faucets"). Additional taps or fixtures in the system might cause a reduction in flow capacity, erratic flow, or excessive pump cycling if several were "open" at one time. How much capacity do you want? Do you want an electric or a manual pump? Whale Gusher Mk III surface-mounted manual pump handles both fresh and saltwater. Some pumps use electricity to operate, and others use muscle power. But almost any pressure water system should have a freshwater and/or saltwater manual pump and spigot as backup. Electrical pump failure should not eliminate your access to fresh water. Do you want to pump both fresh and saltwater? Many galley pumps cannot be used with saltwater because salt will damage the valves and seals or corrode internal metals. However, to conserve freshwater, especially on small vessels with limited tankage, you might want to use saltwater for dish washing. A popular method uses a bucket for the first wash cycle before rinsing the clean dishes with freshwater, either in the galley sink or with the deck shower system. 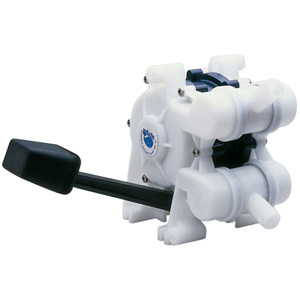 If you want to pump both fresh- and saltwater, select a saltwater-capable pump like the Paragon Jr. by Groco. Where would you mount the pump? This question determines whether you need a self- or non-self-priming pump. Non self-priming pumps have to be mounted at or below the water level, so water is already in the pump chamber. They can push water uphill against gravity. Self-priming pumps can be located above the water level, because they can draw the water up to them when they are turned on. What kind of electrical system does your boat have? Is it 12V or 24V? We offer several pumps for both. Amperage draw varies by capacity, but the 24V model of a given pump may draw approximately half as much current as the 12V equivalent. NOTE: Starting amperage draw might be significantly higher than operating draw. See individual product information on our site. Which port size do you need? Higher capacity pumps will have port sizes of 3/4" or 1" to allow more flow. Some shower pumps offer multiple port sizes between 3/4" and 1 1/2". Otherwise 1/2" NPT ports are very common on freshwater pumps. 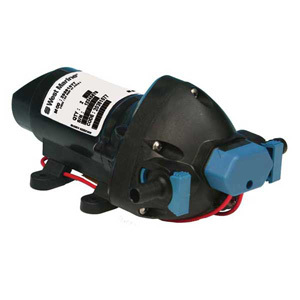 West Marine Freshwater System Pump is designed to meet the needs of most boats with a water heater, shower and up to three faucets. The importance of multiple pump chambers: In diaphragm pumps, more chambers generally mean smoother operation, with less pulsation. Rated GPM: Gallons per minute. Describes the pump's output under ideal (open flow) conditions. This does not take into account head height, friction in the system and other factors that will reduce output. For most boats, high GPM pumps may not be an advantage, especially if the fixtures only permit a limited amount of water to flow. Run dry capability: Some electric pumps can be damaged by running dry. This means that the mechanism burns up or wears out when there is no fluid present. To prevent this condition, some pumps have "run dry" sensors that detect a lack of water flow and shut off the pump to protect it. Vibration dampeners make certain electric pumps somewhat quieter, by absorbing some of the shock in the pump action. A check valve is a mechanical valve that only permits water flow in one direction. It will also prevent city water pressure (which is higher than the pump can handle) from going into the pump. Most diaphragm pumps have check valves built-in. A pressure switch opens the electrical circuit to a pump (and turns it off) when the water in the system reaches a pre-set pressure, usually 35–60psi. It closes the circuit (and turns the pump back on) when the pressure falls below that point. It is the device that makes on-demand pumps function automatically. 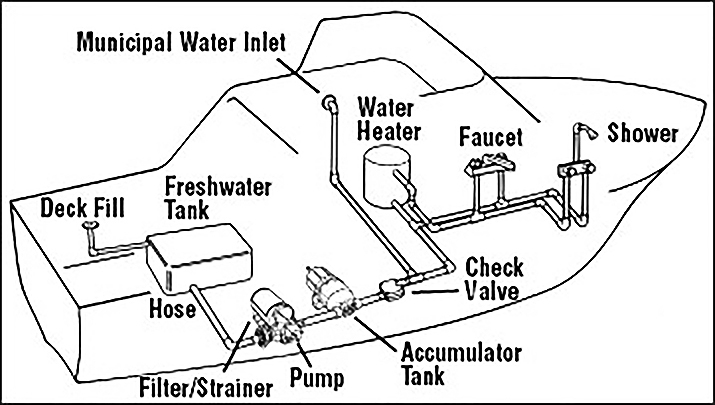 The basic parts of a typical freshwater system with hot and cold water. Freshwater Tank: We think the best tanks are made of thick-walled, high-density polyethylene, but flexible tanks can work in an odd-shaped or inaccessible space. Tank size depends on the space available and your needs (anywhere from one to ten gallons per person per day might be consumed). Make sure your tank's deck fill has a tight seal and that your tank's vent terminates the boat so your drinking water supply won't be fouled by outside water. Hose: Most pumps and fixtures are designed for 1/2" ID hose. Be sure the hose you choose can handle 35–40psi and is made from FDA-approved (nontoxic) materials. Hot-water hoses must be reinforced to withstand high temperatures. Strainer: Any electric pump should be protected by a strainer or in-line filter. Water system and washdown pump manufacturers usually sell strainers that can be attached upstream from their pumps. Accumulator Tank: A sealed air chamber combined with a water reservoir provides expansion volume to reduce pump cycling from minor pressure changes and give a steady flow. Larger tanks can store enough water to eliminate pump cycles when modest amounts of water are needed. Until a few years ago, this was the last word for functional pressure water systems aboard. 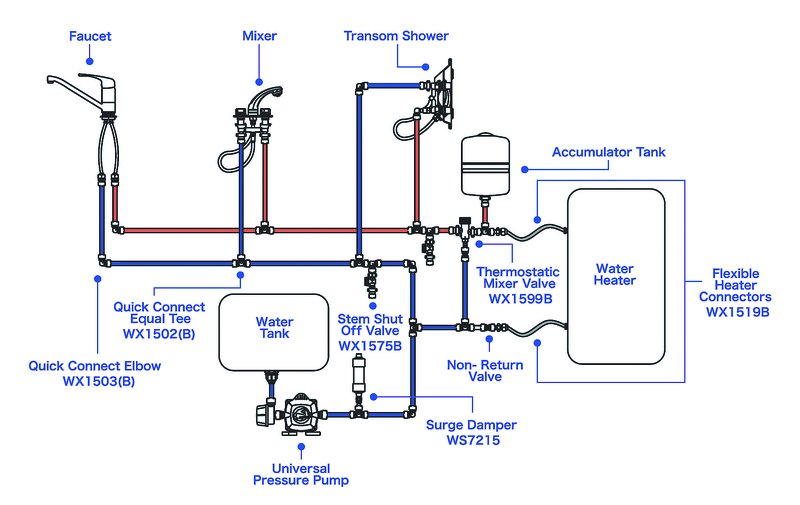 Municipal Water Inlet: By connecting a drinking-water-safe garden hose between a municipal water inlet and a faucet on shore, you'll have a continuous source of pressurized water at the dock without ever having to fill the tank or operate the pump. To protect and isolate your pump and accumulator tank from potentially damaging high pressure, install a one-way check valve as shown in the diagram. Water Heater: The water heaters we carry can be operated at the dock by AC power or underway by drawing heat from your engine's cooling water. Even a small, 6-gallon heater is enough to provide hot water for washing dishes or taking a short shower. Faucet/Shower: Showers, whether in the head or out on the swimstep, can greatly enhance your quality of life on board. Higher capacity pumps with large accumulator tanks will provide the most home-like shower. When adding an interior shower, it is necessary to have a shower sump so you don't fill up your dry bilge with slimy water every time you bathe. Add a water system purifier to your tank periodically to inhibit the growth of algae. The clarity of your water will improve and your system won't grow a permanent green lining. Boat owners who venture far offshore should consider adding a watermaker to their freshwater system. Use high quality hose and hose clamps and inspect the entire freshwater system frequently. Sailboat owners should consider installing a siphon break in the drain lines of sinks, or shutting off sinks' thru-hulls when not in use. It's possible to heel over to where the sink is below the waterline, setting up a siphon that can flood the interior of the boat.